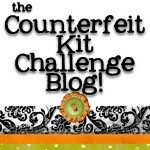 Counterfeit Kit Challenge: Our NSD Winner! What a day yesterday! I'm sorry I did not get to this yesterday! The brakes on our van went out and my son started getting sick (Strep). Congratulations to Lesley! Make sure you e-mail me at counterfeitkitchallenge@yahoo.com so I can pass your info along to Olga! YAY!!!! I can buy more loveliness now :) Thank you very much. Hope things improved for you yesterday. Congrats to Lesley! ;-) Enjoy!